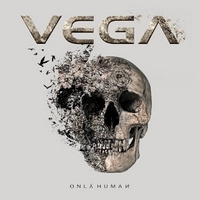 Vega is a British melodic rock outfit which was founded in 2009 by Tom and James Martin. With former Kick vocalist Nick Workman they found a great singer with a unique voice. With Only Human Vega is presenting their 5th album, they kick off with Let's Have Fun Tonight. A heavy melodic rocker with ennobled by Nick Workman's vocals. The band works like a well-oiled machine, even if they have a new drummer Martin Hutchinson and guitarist Mikey Kew on board. A melodic rock is Last Man Standing which starts with spoken words and is just fun - like the whole album! The emotional balladesque tune Standing Still is one of my faves, it's easy to get lost in this one. A guitar-driven up-tempo rocker is Gravity, and another highlight of the new Vega album. The title track is a mid-paced rocker with big backings, catching lead vocals and great guitar lines - it has all the strong points of the Vega sound. Actually I find it tough to describe Vega's music, but just because I can't focus on writing when listening is so much fun! If you are a fan of Vega, you'll get the album anyway. If you are not, but like melodic rock, hard rock, classic rock and AOR, then I can just recommend to give it a try! Kick's debut album Consider This... was my favorite album in the summer of '99 and I was happy to hear that Nick Workman is back with Vega. For me Consider This... was a masterpiece and so I had high expectations - and Kiss Of Life full-filled them. Like Up Close & Personal the opener Into The Wild hooked me up immediately. But it's not just Workman how shines, guitarist Tom Martin adds some great leads. The Martin brothers wrote songs for House Of Lords, Ted Poley and Sunstorm - among others - and again they show their love for 80's hard rock but in a modern way. Singer Nick Workman is adding the special something to the tunes with is unique voice. The title track is an up-tempo rocker with heavy guitars which are supported by cool keyboard lines and the memorable chorus you'll soon start humming. And you'll start singing along Staring At The Sun after the first spin. A keyboard-laden track which is peppered up with heavy riffs and an expressive solo. A guitar-based ballad you get with Too Young For Wings which features Nick Workman's vocals. His powerful, expressive voice makes this one shine. But once again Tom Martin is showcasing his skills in a short but great solo. With Another an up-tempo rocker, a real party tune follows. This is pure fun. James Martin's keyboard leads you into Hearts Of Glass, an up-tempo rocker with a memorable riff. With Stay With Me they present an 80's rock tune with a catchy hook and modern guitar sound. Wonderland is a modern rocker with an vocal opening part which reminds me a bit of a part of Karn Evil 9 (Emerson, Lake & Palmer)... Beside that this track has nothing in common with ELP. It's more modern rock. The closer SOS is a keyboard-laden tune, but then the guitar gets more prominent. And the first mid-paced tune speeds up and becomes a guitar-driven rocker. A good way to end Kiss Of Life. Everybody who loved Kick will fall for Vega. 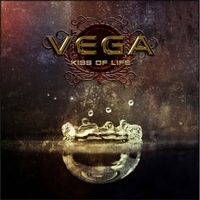 But I can just recommend Vega's Kiss Of Life to every fan of high class melodic rock! A must-have - at least in my opinion.